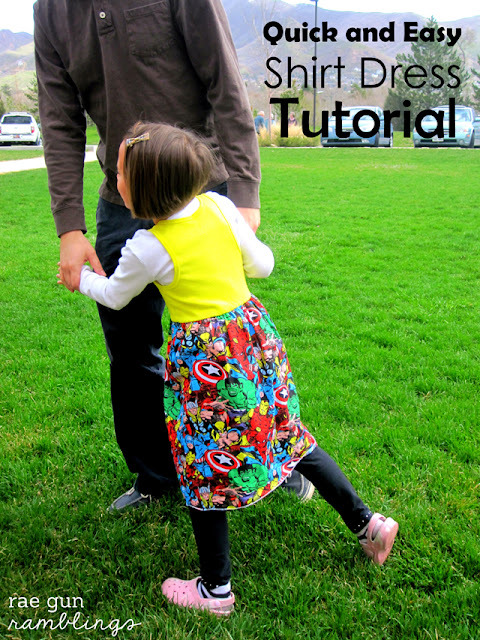 Today I’m sharing a super easy kiddo dress. T is current crazy obssessed with super heroes. 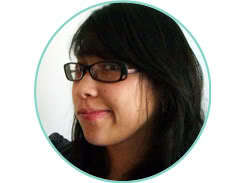 You will remember her obsession with Avatar’s Waterbenders and He-man and She-ra. She’s all about being strong and brave and courageous. I really love it. So when I found this fun comic book fabric I knew I needed to make her something fun. This little dress is a spin-off of my upcycled shirt dress tutorial that I shared last year. But I did a few things differently on this one. I use both ways it’s just whatever I’m feeling at the time. Check out both and see what sounds better to you. For this I used a tank top and half yard of fabric. Start by cutting the shirt to a proper bodice length (I just held it up to a dress that I knew fit properly). Then cut a piece of elastic the same length as the circumference of the edge of your shirt. Take the elastic and while stretching it serge it into the top edge of the skirt. This will gather it up and make it stretchy. One tip I do is to mark the half way point on the skirt and the elastic so I know about how much to stretch it (you want those points to match up). 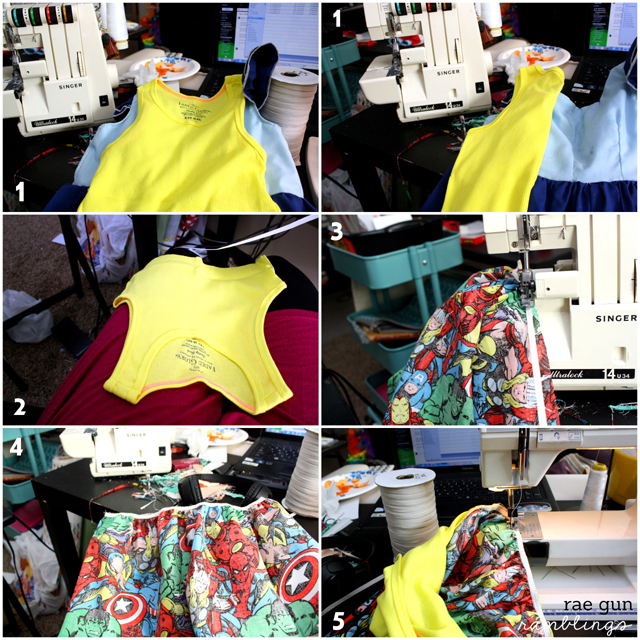 If you don’t have a serger you can do the same thing by finishing the edge of your skirt fabric and then instead of serging use a 3-step zig zag stitch to put in the elastic. Next attach the skirt to the bodice. Pin the trimmed top to the skirt right sides together then run a 3-step zigzag to attach the two. This will allow for some stretch and the elastic that you put into the skirt part will help it keep it’s shape. Easy and cute especially for fabrics that are more fun and funky right? It’s one of those comfy easy to wear styles that you can make with just a little bit of fabric. And the best news of all is that she’s been wearing this super hero dress all the time! Who else is joining on on the Spring Kids Clothes Week? How has sewing been? I’ve had kinda a busy week with the shop so while I’m sewing a lot of kids clothing it’s mostly been orders. I did finally fix T’s Water Princess dress but hopefully tonight I can get something started for the nieces and a baby birthday party I’m headed to. This is so cute! PS, what does the 3 step zig-zag stitch look like? Ya know, what’s the little image gonna be on my sewing machine? seriously she’s worn it almost every time I’ve seen her in the last few weeks it’s awesome when you make something they actually want to wear!